Hey, remember this series? If you do, great, it’s back and better than ever–or, possibly, about the same. If you don’t, what we’re doing here is plugging a recruit’s name into Google and synthesizing the bits of information that come out–guru ratings, newspaper profiles, YouTube highlights, all that stuff–in the hopes of getting a clearer picture of the kind of player we’ll see at Auburn next fall. Enjoy. When Auburn fans remember the notorious/notoriously awesome Big Cat Weekend these next couple of years, they’ll think about Lache Seastrunk calling out the coachbot, the punishments handed down by Mike Slive, the refreshing sense it gave us all that come hell or high water Auburn’s coaches were going to recruit, dammit. Etc. Curry is a physical football player with great instincts at linebacker. He plays the game the way it is supposed to be played with great toughness. His skills and knowledge of the game could land him at middle linebacker, outside linebacker, or fullback in college. While tackling and instincts are strengths, he needs to work on his change of direction and overall speed. “Great toughness,” “knowledge of the game,” “needs to work on … overall speed” … based on the above scouting report, how much would you have wagered Curry was white if I hadn’t have posted his photo up there? $1,000? $5,000? Your immortal soul? Curry is a stout and strong fullback. He has good size and the frame to even get bigger … Very reliable short yardage fullback that doesn’t have breakaway speed but is very steady. Catches the football well out of the backfield when running the flat route and can get turned north and south for positive yards after the catch. A solid lead blocker on the off tackle, iso and draw play. Lowers the shoulders and drives the legs as a lead blocker while working for position after the initial blow delivery. Curry is a very sound and solid one dimensional football player. I think this may be the most worthless ESPN scouting report for our purposes I’ve come across, since it doesn’t make a single mention of his potential at linebacker or even that he plays LB at all. Isn’t a guy who’s being recruited at linebacker by definition more than “one-dimensional”? Whatever. There’s a couple of other factors that might be a better gauge of Curry’s potential. One is his offer list: as mentioned before Curry decommitted from West Virginia, and Scout also lists offers from Wake Forest, Louisville, and South Florida. Not as impressive as the offer sheet for some of Auburn’s other commitments, but hardly two-star stuff, either. And more importantly, remember that Auburn’s coaches didn’t wait to try and pick Curry off at the end of the recruitment process: they offered early, brought him to Big Cat, and wrapped up his commitment with a quickness. Ted Roof wanted Curry, and that counts for a lot in the WBE book. Assuming you’d like to see a little more, ESPN has film from his junior year at Buford. And while I’d always caution about reading too much into a highlight reel … doesn’t Curry look a little more athletic here (especially at 6-2) than he’s given credit for? Even as a youth football player, Jessel Curry understood one thing very clearly. “I’ve always felt like the end zone was mine, and that nobody was going to get in there; that’s what my dad taught me,” Curry said. Buddy Curry’s son obviously listened well to his father — an 8-year NFL veteran who starred at linebacker for the Atlanta Falcons — as Jessel now leads Buford’s dominant defense with 98 tackles. Curry has also been a key vocal leader in 2009, helping unite a young Wolves team that features a strong senior corps but also relies on starting double-digit numbers of sophomores. Perhaps the best lesson any young player could learn from Curry is the value of work ethic. And after playing at outside linebacker last season, the speedy Curry has adapted well to the more physical role of playing middle linebacker. However, he has also shown plenty of speed and athleticism to drop back into pass coverage and leads the Wolves with five interceptions. Oh, and did anyone mention Curry has also averaged 35.5 yards per punt? However, doing as much as Curry has done for Buford does tend to take its toll over time. He’s is currently playing with a torn ligament in his thumb, which he suffered while posting double-digit tackles, grabbing an interception and hauling in a 50-yard touchdown pass in a 21-0 win over Westminster on Oct. 30. The Gainesville Times reports on Buford’s semifinal win–Curry had three TDs–and back in 2007 looked at the surprisingly large collection of Buford players with NFL fathers. “Coach Roof is going to be like my dad,” Curry said. Speaking of Roof, he’ll be there live and in-person to watch Curry’s title game performance before Curry takes his official visit to Auburn this weekend. Lastly, you can check out some random Flickr Curry photos here. What conclusions we can draw, if any: Looking over the 2010 defense last week, I said I was “pretty stoked” about Curry but mentioned the other three members of Auburn’s projected 2010 linebacker class as more likely to make an immediate impact. Can I have a do-over? Because when you look at all the things Curry brings to the table, there’s not going to be much difference between him and the other three ‘backers, even as outstanding as LaDarius Owens, Jake Holland, and Jawara White project to be. Curry’s clearly got the work ethic, the instincts, the coaches’ seal-of-approval, even the physical frame. Getting a head start in the spring could be huge, both from the high-school-to-college adjustment and–especially–from getting on the Coach Yox program ASAP. If Curry fills out that frame in a hurry and can maybe get just a touch faster, who knows where he could end up? Even if Curry doesn’t wind up contributing immediately, he’s got so much going for him it’s awfully hard to see him not contributing sooner rather than later. He’s just one more reason this class of LBs will have Auburn in solid shape even after Bynes and Stevens depart in ’11. Dad was a beast w/ the Falcons. I think Buddy starred w/ ATL during the brief period when SI had an actual “Falcons: The next dynasty?” cover. Big hitter, hard nosed, tough guy. Hope the kid got some or all of that. Thanks for bringing this back this year Jerry. It’s perhaps my favorite of all the old JCCW features. Hope you get to do it for all the recruits, love going back and reading the ones from last recruiting class, especially ones like Darren Bates. Keep it up! My pleasure, Weagle. Wish I’d been more enthusiastic about Bates, but I did at least note that he had a lot of factors (Tennessee offer, ‘Bama interest, Olive Branch coach guaranteeing his success, etc.) that suggested he was better than his ranking. Speaking of rereading the old entries, any chance you could fix those links? During the long, cold, dark days of the off-season I like to go back and read about some of the players that red-shirted this year. Marcus, I can probably do that, yes. I’ll let you (as in everyone) know. I saw Curry play in person yesterday in the Georgia AA state final. 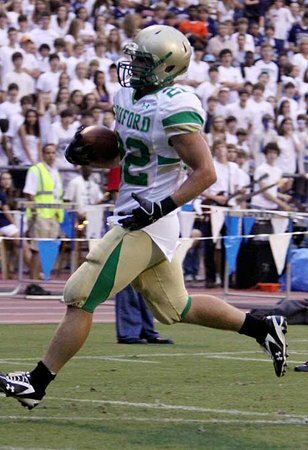 He scored both of Buford’s touchdowns – one on a short run and the other on a pass play. Had a number of tackles on the defensive side too, and was named MVP of the game I believe. This kid is used to winning.